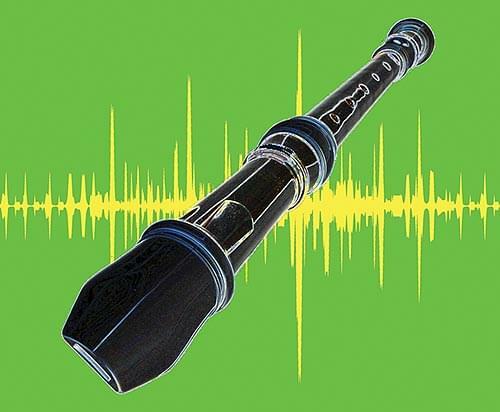 Recorder Bytes utilize interactive, projectable PDFs with embedded audio that help teach music your students are learning by using a controlled, methodical approach, all while keeping it fun. Use them as a stand alone teaching resource, or in tandem with popular methods like Recorder Karate 2. Here's how it works: The music is broken down phrase by phrase. Each phrase of music has been arranged in a call-and-response manner for students to practice. The music notation for each phrase along with its corresponding audio are projected in the classroom so that everyone can see and hear it while playing along. After each phrase of music has been practiced and learned - first at a slower tempo and than at a faster speed, all of the phrases are then strung together comprising the entire song. The Wedding March – Uses DEF#GABC'D', dotted rhythms, tempos are 84 and 100. Old Joe Clark – Uses CDEF#GABC', dotted eighth beamed to sixteenth rhythms, tempos are 63 and 70. On Top Of Old Smoky – Uses CDEFGAC', ties/long held notes, 3/4 meter, tempos are 90 and 112. Can Can – Uses CDEFGABC', steps, skips, descending scale, tempos are 63 and 72. America – Uses EFGABbC'D', dotted rhythms, slurs, 3/4 meter, tempos are 80 and 88. Polly Wolly Doodle – Uses EFGABbC', 8th notes, quarter notes, half notes, dotted half notes, tempos are 96 and 120. I've Been Working On The Railroad – Uses CDEFF#GABb, swing style, accidentals (F sharp and F natural), tempos are 88 and 100. When Johnny Comes Marching Home – Uses EGABC'D'E', 3/4 meter, ties/long held notes, tempos are 92 and 104. Eine Kleine Nachtmusik – Uses DEF#GABC'D'E', staccatos, ties, slurs, 16th notes, tempos are 69, 80, and 90.